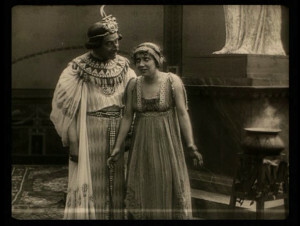 “The Last Days Of Pompeii” (1913) is among the last of the great tableaux films. In this rendition of Bulwer’s classic novel, set in 79 A.D., the lives of a prominent statesman, a beautiful woman, a pagan priest, a spiteful witch and a blind beggar are carefully interwoven and brought to a climax at the moment the sleeping volcano unleashes its fury. Edison Studio (Mauro Cardi, Luigi Ceccarelli, Fabio Cifariello Ciardi and Alessandro Cipriani) has composed a computer soundtrack on several layers: symbolic sonic backgrounds and foregrounds, dialogs in “improbable” languages, (un)naturalistic references. In the spirit of silent movie tradition soundtrack is performed live. The work has been selected for performance at ICMC2002 (Goteborg, Sweden). The Egyptian priest Arbaces falls in love with Jone, promised to Glaucus, and so as to have her for himself uses a magic brew to drive insane his rival who is then sentenced to die in the arena. The eruption of the Vesuvius in 79 A.D. destroyed Pompeii, allowing the two young lovers to meet and survive the disaster. The Last Days of Pompeii was the first Italian colossal, produced by Ambrosio Film in 1913 and directed by Eleuterio Ridolfi. The film is still today a masterpiece of black and white cinematography; great scenes with the masses, quotations from classical art, impressive final sequences (the circus and the volcano’s eruption) experimenting with in-depth filming techniques. Dealing with this prototype silent film with special effects, the Edison Studio, using both live and delayed new technologies, composed a soundtrack on various levels: symbolic sounds, complex background sounds, dialogues in ‘improbable’ languages, non-naturalist references. “Based on the masterpiece by Bulwer Lytton”, as we read in the first frame of the film, and then Pompeii and its streets come to life and arereanimated with sounds, such as the electronic murmur and the bubbly buzzing that give immediacy to the film by means of the computers of Edison Studio. Voices without words, sounds to express the emotions of each character, such as the watery gurgling of a love potion that is actually poisonous. The drama and the comedy, sometimes unintended, of pompous and bewigged actors in togas and tunics trying to revive a Pompeii made of cardboard, full of swooning women and neoclassical scenes based on Pompeian artworks. The witch who dwells upon Mount Vesuvius reminds us for a moment of Amelia (the witch who enchants) and the arena with its gladiators resonates with the noise of a winning goal in a modern football stadium, including the trumpets from the stands. It must be a marvelous job to bestow such sounds upon an old movie, giving a soul to dead things and imparting resonance to what really cannot be dubbed or accompanied by a commentary. It was a brilliant idea to do this. The blind Nidia, who staggers through the scene, like a sleepwalker or a mummy, with eyes upturned and unsteady movement, bumps into Ida and scares her. And until it actually happens nobody has any idea that the eruption is imminent. Then, when the smoke rises and everything around starts to burn, Nidia rescues the man she loves, but she must surrender him to another. She lets them escape by ship and, a romantic heroine to the end, she commits suicide by throwing herself into the sea. In fact fleeing to safety by sea was impossible on that day, but Bulwer Lytton could not have known that the skeletons of those who fled to the port of Herculaneum would be discovered eighty years after he wrote his book. These wretched people never managed to set sail to salvation on the waters. Instead their teeth exploded with the heat and their blood boiled in their veins.